It’s a dilemma, isn’t it? You recognize a problem, you want to help…but the enormity of the thing stops you in your tracks. There are problems confronting us that require massive shifts and unprecedented collective action to solve. When there seems to be scant sign of that happening, you’re tempted to throw up your hands in despair. Individual action seems like such a tiny drop in the bucket, like such an irrelevancy. You’d be forgiven for wondering if individual action really has any impact at all. But you know…there are a lot of individuals. And a lot of us are taking action. So absolutely, yes: your efforts at recycling, at reducing, reusing, repurposing, and everything else you’re doing to mitigate your carbon footprint is meaningful. Are those efforts making a real dent on the overall atmospheric carbon levels that are endangering our climate and our planet’s future? Maybe not…. But your efforts, plus mine, plus those of everyone else who’re taking this problem seriously, and doing something about it, add up to real, positive change. That can and should give us the hope we need to sustain us, while we get this sooty house in order. So with that in mind, I’m pleased and honored to participate in Green Gestures, a project sponsored by the online shopping portal, Retale.com. The project couldn’t be simpler, and it’s nicely summed up by the graphic above: One Blog, One Tree. By virtue of spreading the word (which of course, I’m doing right now), Green Gestures commits to planting a tree on behalf of Worden’s Cultural Deconstruction. That’s it. 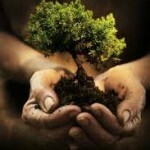 One blog at a time, one tree at a time; Green Gestures is offsetting the carbon footprint of the blogosphere. One little tree, soon to be planted. Once it reaches maturity, it can be expected to absorb 29 pounds of carbon dioxide per year, or more than a ton over the course of its lifetime. If every blog out there likewise had a tree planted in its name—well, we just might get a handle on this thing. Here’s hoping we do. Many thanks and undying respect to Amelia Shroyer, the project manager for Green Gestures, for contacting me and inviting me to participate. And many thanks to you, fellow blogger, for joining in. You are going to join in, aren’t you? This entry was posted in New Post and tagged Amelia Shroyer, carbon footprint, climate change, Green Gestures, plant a tree, Retale.com. Bookmark the permalink.